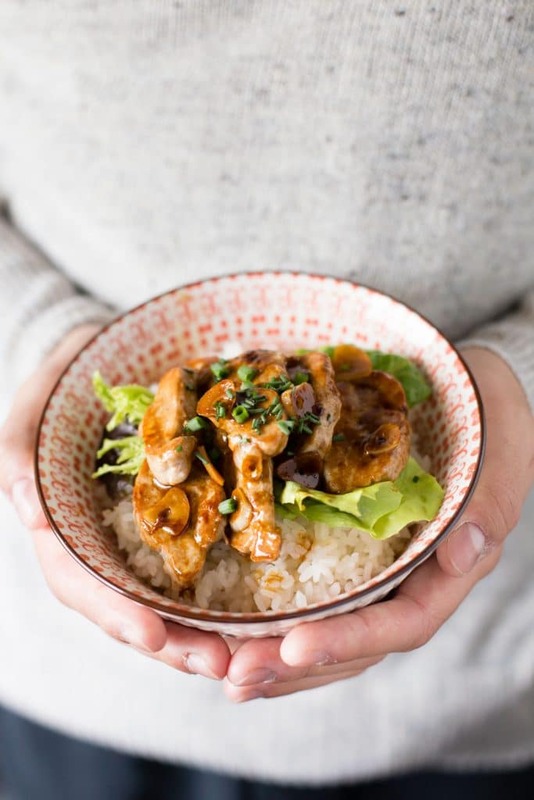 Buta Don (sometimes spelled Butadon or Buta-don) is a quick and delicious Japanese dish that only requires a few ingredients, and can be cooked in under 15 minutes if you already have leftover plain cooked rice. 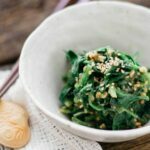 It is a meal perfect for those times when you need something super delicious but quick and easy to prepare …like when my hungry son drops in from out of the blue! My next thought was Sweet and Sour Pork but it takes quite a while to cook (a lot more than 15 minutes anyway). So, I reexamined my fridge, and saw that I had lettuce and garlic, and I was struck by inspiration. 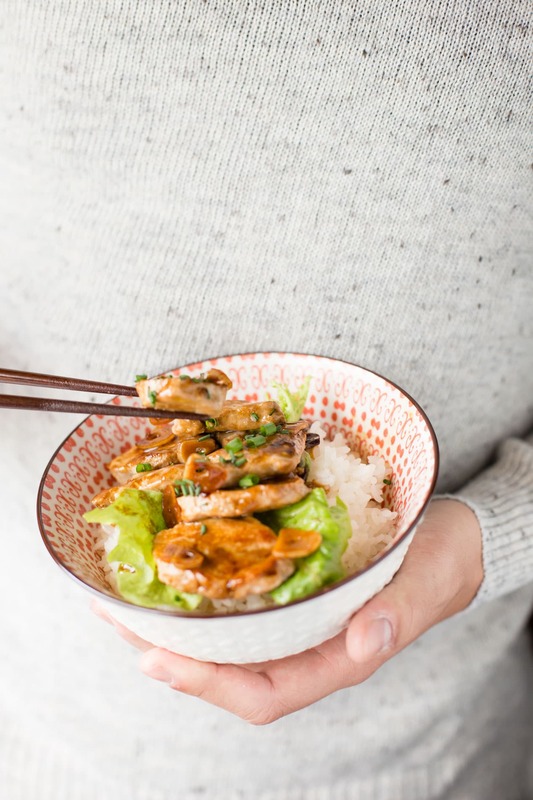 I decided to make a popular donburi dish like you would get from a take away shop in Japan. I was transported back in time to my old training days as a young nurse over 25 years ago. I was living in a hospital dormitory, and while our dorm rooms provided meals, we were still the typical hungry students who would often would cook something a little extra ourselves after the kitchen was closed! Our go-to base for an easy meal was soy sauce and butter, making something like Yaki Onigiri. 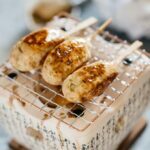 I have shared Miso Butter Yaki Onigiri with you before, but we made this flavour combination often as well. My Japanese taste buds assured me that the holy trinity of Miso, Soy Sauce, and Butter would result in a fantastic meal, with out me needing to consult my flavour bible (a.k.a. cookbook). I sliced the meat into small strips, searing them in a fry pan for 1-2 minutes on both side, and then letting them rest off the heat, but covered with aluminium foil to keep them nice and moist. Meanwhile, I quickly made the sauce, and served the crisp lettuce, juicy pork, and succulent sauce over some fluffy cooked rice. There are many different variations of Buta Don in Japan, but personally I think this flavour combination is the best. My son certainly loved it and off went to University for a lecture with a full tummy and a happy heart. 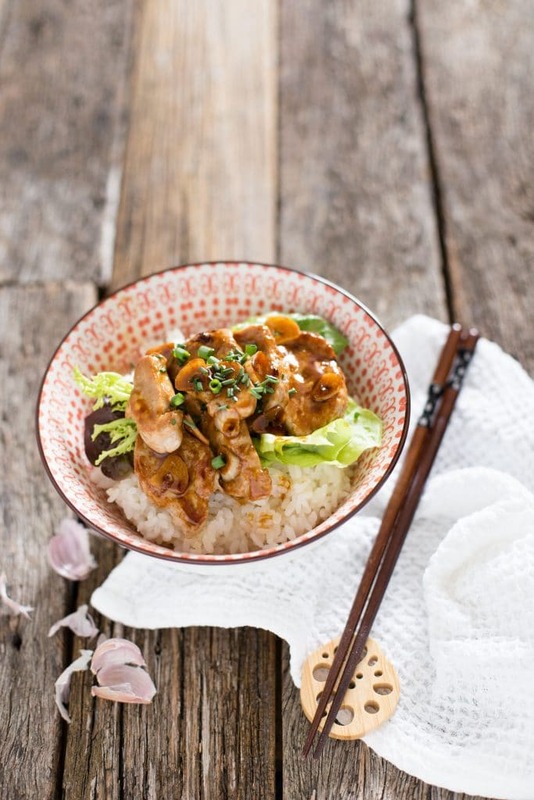 Buta Don is a quick and delicious Japanese dish consisting of rice, topped with pork, and glazed with a savoury sauce. Buta means “Pork” and Don means “Bowl”. Peel the garlic and slice very thinly. Set aside. Wash the lettuce thoroughly and tear into small pieces. Set aside. 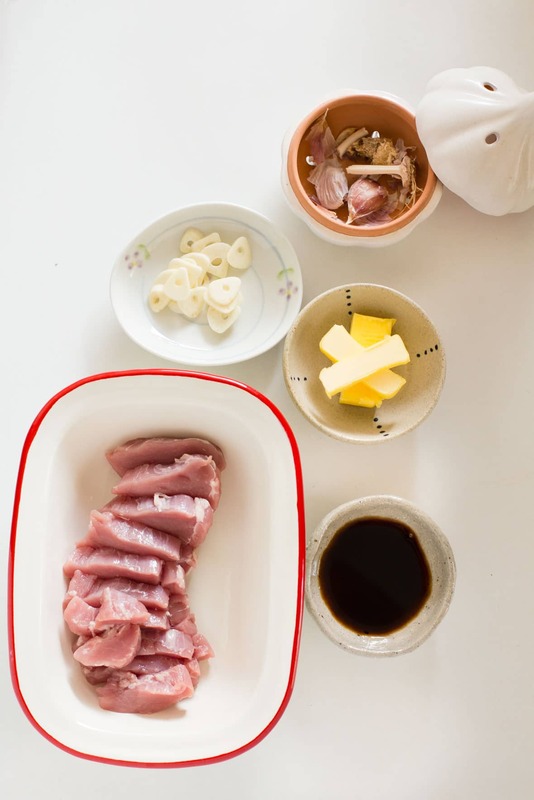 Slice the pork fillet into about 1cm thick slices, making sure to season with salt and pepper. Heat 2 tsp olive oil in a frying pan over med-high heat. Place the pork fillet in the heated frying pan. Cook about 2 minutes one side then flip over the pork fillets and cook another 2 minutes. Turn the heat off, and transfer the pork fillet from the frying pan to a plate. Cover the plate with aluminium foil to rest. Put the frying pan back on medium heat. Add the sliced garlic and cook for 1- 2 minutes until the garlic become golden brown and crunchy. combine soy sauce and miso paste. Add 20 g butter and the combined soy sauce and miso to the pan bring to bubble. 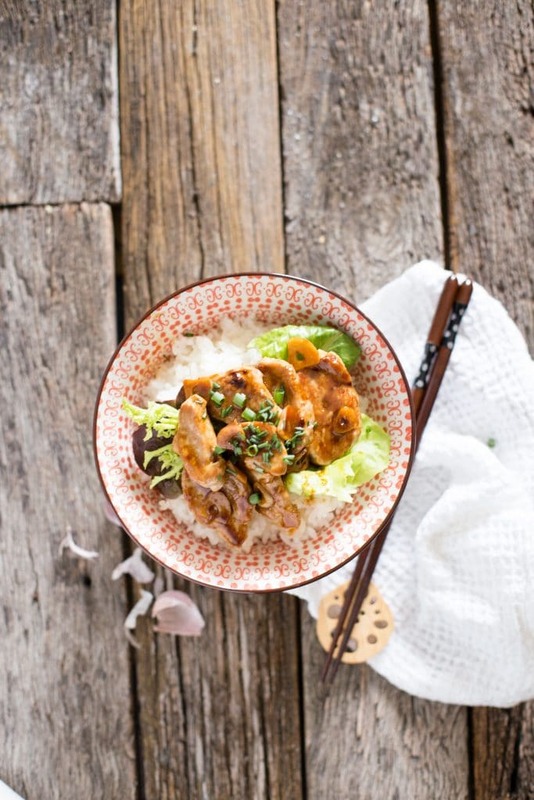 Serve rice in a donburi bowl, scattering the lettuce, and placing the cooked pork fillets on top. 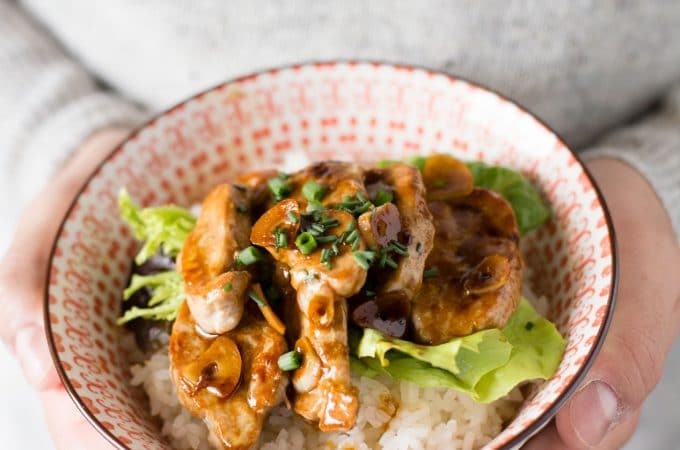 Drizzle the garlic soy sauce butter over the pork and rice. Garnish with chopped green shallots or chives. Any cut of pork can be used. 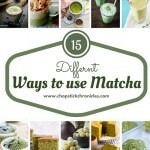 *1 any type of miso-red, white and mix. This Recipe looks so yummy!!! Love this sharing so much! !Thanks for sharing. super easy to follor recipe great! I love the recipe and it’s dilicious I want to use to my upcoming restaurant menu Yaamy Oishi desu ney Arigato gozaimasu. I don’t see the miso in the recipe. It looks fabulous and I’d love to make it this week! Still not seeing any miso in this recipe. Also you might want to fix the typo “plive” oil. Thank you.